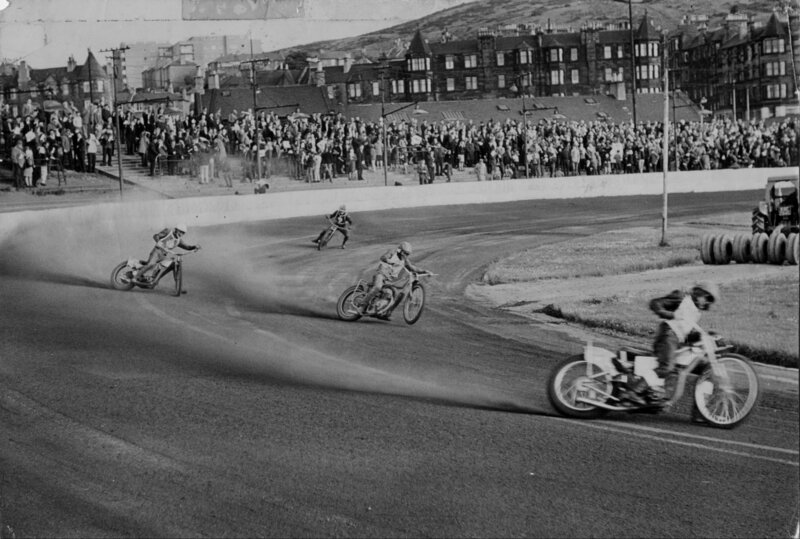 Speedway at Old Meadowbank was Saturday Night Heaven for many thousands of Monarchs' fans from 1948-67. This fine shot shows the sweeping first and second bend, banked (more than it looks here), and the secret of the good racing was that the straights were relatively short and didn't allow anyone to build up too much of a lead. Outside and inside lines usually worked. It was no smart stadium but it was a great track. This shot is from 2nd July 1966 and shows Bengt Jansson, Reidar Eide, Graham Coombes and Mike Watkin. There's a good crowd on the bend and the Meadowbank area houses, little changed 40 years on, are clear in the background.